But I’m a people’s person!! Jason started off the morning by comparing organisations to relay running. In a relay race, participants run around passing sticks to each other. Okay, it’s more complex than that but you get the gist. Sometimes while passing the baton to the next runner, they might drop it. Things happen. Runners will then train harder, learn passing techniques, get leaner etc; and they’ll get better, faster and drop less batons with time. As organisations grow, some things get dropped. And oftentime instead of focusing on how to get leaner, organisations will instead add a “baton passer” to be in charge and accountable that the baton gets from one set of hands to the other. If we put one person in charge and accountable for something, then it’ll for sure get done, right? But what you end up with as company continues to grow is less runners moving you forward and just more “baton passers”. Lean organisations on the other hand, don’t want unnecessary specialisation. They want T shape people with depth of knowledge in some area (like programming) as well as an interest and understanding of a broad range of other disciplines (like user experience). The result: lean organisations are faster and stronger because they hire and nurture the relay runners and not the “baton passer”. How many of the following statements would you agree with? Say whaaaat?!?! Jason almost lost most of the crowd at the workshop when he made that last statement. For me it was a very loud and definite “NO”. What will it take for me to convince you that Waterfall methodology is the right way to go? Some of you might be screaming “absolutely nothing!” in your head. And I was the same. I had an immediately and very strong reaction to that question where I’ve already made up my mind and no matter what was going to be said after, it was never going to convince me that Waterfall is the way to go. And now imagine that that’s exactly how some other people feel when you tell them “Agile is the right way to deliver software”. Some people have such a strong and immediate negative reaction to that statement that no matter what you say after, you will never be able to convince them by starting off making a statement like that. And that doesn’t make them crazy! Did you experience first hand the failure of a Waterfall project? Well what if they have experienced the same with an Agile project? What if instead you ask them how they would do a project. I bet you most of them would say (more or less) something along the lines of “Well, I want to understand what needs to be done, design it, build something that works and ship it”. Yes! That’s pretty much how we’d do it as well, but we’d do it more frequently and in smaller batches. Ultimately, in the context of software delivery we all want the same thing: to deliver the right thing in the right time at the right cost. As a change agent, start with what people believe, value and do; establish a common goal; and focus on the positives. Don’t start off with by pushing your beliefs or approach on to them as “the best”. I personally think the term “Agile” has been bastardised almost beyond recognition by individuals and organisation using the “Agile stick” to force change or beliefs onto others. And it was fantastic hearing Jason Little say to take “Agile” and “Waterfall” out of the conversation completely! Focus on what’s good and agree on ways to eliminate waste and continuously improve. Drive positive change together. How many of you have seen this video before? If you haven’t, get ready to laugh (and learn). Even though I’ve seen the video below previously, it was the first time I watched it with this commentary. Although hilarious, it’s also very insightful into how movements and change happen. The movers are the leaders. The movables are the people that can be converted to the believers or to the non-believers of something. And the immovables are the ones that just won’t budge. They are strongly opposed and resisting to whatever the movement the movers are trying to start. 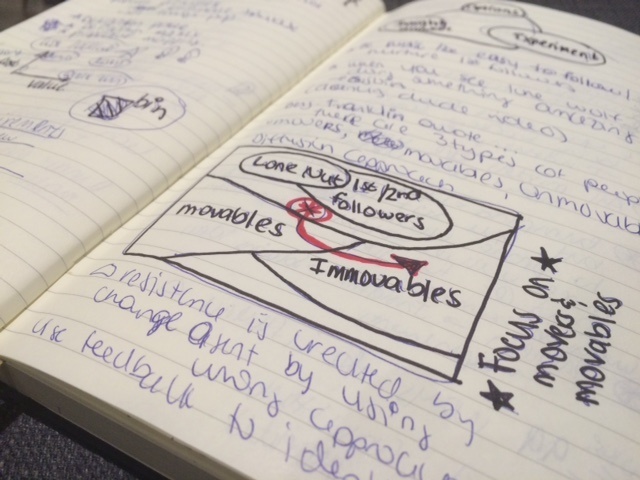 Change agents often focus their attention on converting the immovables to understand and join the “movement”. Most of the time that results in spending insane amount of energy and time in vain trying to convince someone that has no intention of trying to understand or consider your suggestion. What if instead we focus more on the majority of people, the movables? The people that are willing to listen and to try. The people who are not absolutely and unconditionally opposed to the change you’re trying to bring around. Nurture the first few followers. Facilitate them with the skills they need to bring about the change. Help them become the movers who will then help to do the same with the movable group. And then maybe, just maybe, the majority will convince the immovables to try something new and give change a chance. And then, well, then you may have just started a dance revolution! Red Badger offers an annual £2,000 training budget to experience things like this. Sound good? Then come join us.